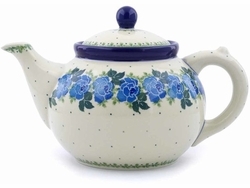 Polish pottery teapot - Perfect handmade gift for any tea or coffee lover. A great addition to your polish pottery stoneware dinnerware set. Meticulously crafted and hand-painted at famous Ceramika Artystyczna factory in the Boleslawiec region of Poland and available in a varieties of patterns, this stoneware Coffee/Tea Pot is perfect for everyday dining as well as for entertaining. This teapot is for brewing and serving. Never place it on the burner of a stove.